Most of Dade County ventured over to Larry & Penny Thompson Park for the Cross Country Youth Fair. Ferguson Coach Ryan Raposo guarantees it to be a good time for all ages from middle school to high school. The boys varsity race was the Belen Jesuit show. A week after dominating at Pre-State Elliot Clemente and company bring their "A" game once again and tell not just the state of Florida, but the rest of the nation why they are a team to be reckoned with. Clemente cruises to the win in 15:33.43. Lopez, Magoulas, Tejidor, and Thomas round out the top five to give Belen a perfect score for the afternoon. 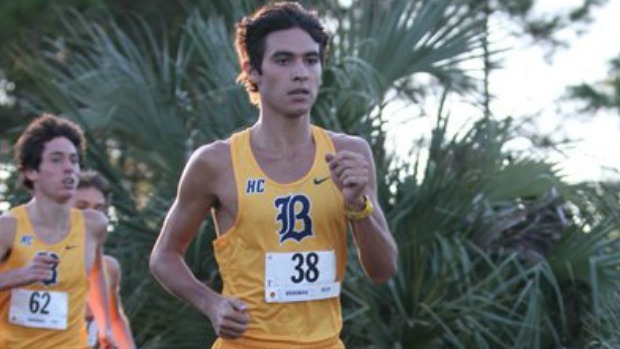 Bert Irigoyen finished tenth to lead Ransom Everglades to a second place team finish. On the girls side it was Gulliver Prep senior Joanna McCoy proving that she will be a name to remember come November. McCoy went out hard and took advantage of Ferguson's Lauren Gonzalez not being at full strength. Those two finish first and second in 18:57.73 and 19:20.04 respectively. Ferguson wins the team title with a 19:30 average placing all seven runners in the top eleven. The win was the first time since 1998 that Our Lady of Lourdes did not win. Lourdes who ran a shortened squad (missing were Courtney Filliben, Bianca Barrios, and Emily Castella) finished second followed by Carrolton who is quickly making themselves known as well. In the JV ranks, it was the brother-sister schools of Belen and Lourdes winning big. The Belen JV squad picking up where the varsity guys left off placing their top twelve runners in the top twelve places! Sophomore Andres Fernandez led the way with a time of 17:18.67. Sister and neighbor school Lourdes showed their depth as well with their top five runners in the top ten led by freshman Natalie Barrios who won in 22:14.09. Ammons Middle School swept the girls middle school races while Belen Jesuit swept the boys.